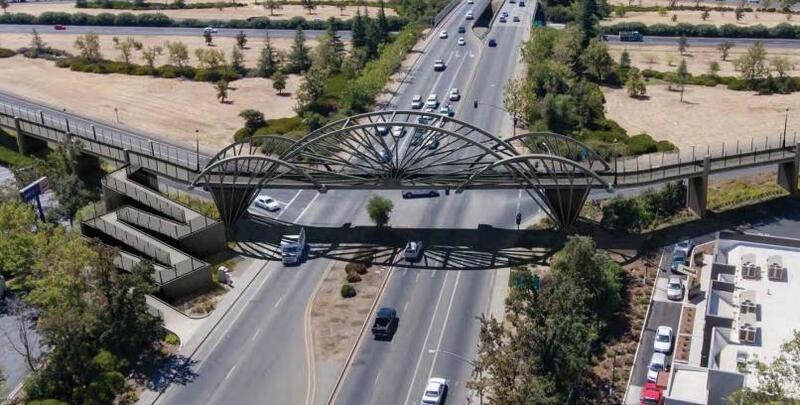 The bridge, whose formal name is the 20th Street Pedestrian/Bicycle Overcrossing, is in the city of Chico and is part of the Bikeway 99 cycleway project. The project's consultants are Dokken Engineering, Bennett Engineering, Holdrege & Kull and MacDonald Architects. Three designs were developed for the city council, with a design called 'Tree City' emerging as a public favourite. Chico has long been designated as a 'tree city' by the USA's National Arbor Day Foundation. The city's streets are lined with rows of oaks, maples, buckeyes, cottonwoods and other species. A report prepared for the city by Dokken Engineering in late 2017 said that, as a result of community feedback, a variation of the design would be studied with modifed members to more closely resemble a bicycle wheel as a link to the city's cycling community.